Educational Technology Guy: What I learned this year. What I learned this year. I just replied to a question Shelly Blake-Plock posted on his blog, Teach Paperless, "What did you learn this year?". (His blog is really good, check it out). 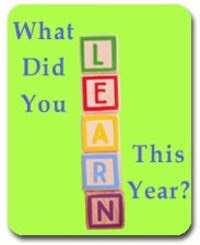 What did you learn this year? Post it here or over at Teach Paperless.